Paleo Jalapeño Salmon Burgers with Garlicky Slaw for an easy homemade oven-baked gluten-free salmon burger recipe! I crave salmon burgers on the regular. A few times a month I love making different homemade burgers and salmon ones are always my go-to. Especially these new Paleo Jalapeño Salmon Burgers with the dreamiest garlicky slaw. They are gluten-free, dairy-free and they’re so easy to make. Plus they aren’t too spicy (I have very little spice tolerance) but the jalapeño just adds that little bit of flavor to them. When I make homemade salmon burgers, I always use canned wild salmon. It is easy to find thanks to Safe Catch and it actually tastes amazing. My whole family is obsessed! Safe Catch is my go-to for both wild salmon and tuna. I trust their products and every single batch is tested for mercury too, making me feel comfortable eating it. You never know with fish these days, so it is so important to me to eat quality fish. These Paleo Jalapeño Salmon Burgers require minimal prep work but they do need to set in the fridge for at least 20 minutes so they form a bit. Then I bake them in the oven (helps prevent any smelling or yucky odors from cooking fish) until they’re ready. I pair it with a delicious garlicky slaw and they taste amazing together. 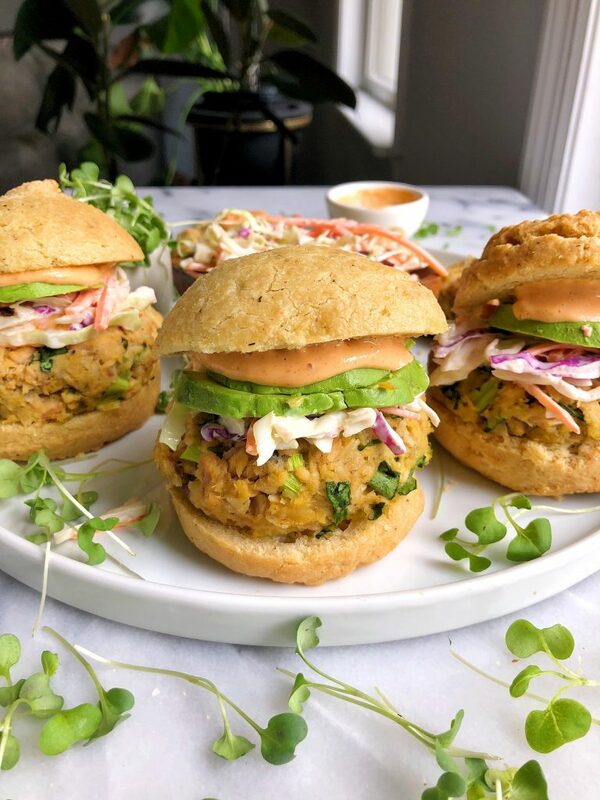 I love that these salmon burgers are also packed with greens, giving them that extra boost and serving of veggies (always trying to sneak more in!). 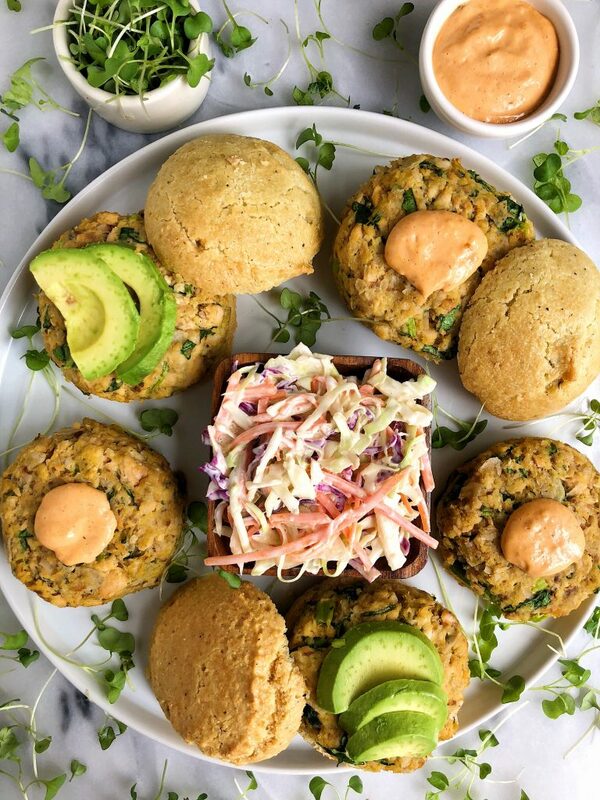 I used paleo buns from my favorite Hu Kitchen (got them at the restaurant) but these also taste amazing on an english muffin or any bun you want! 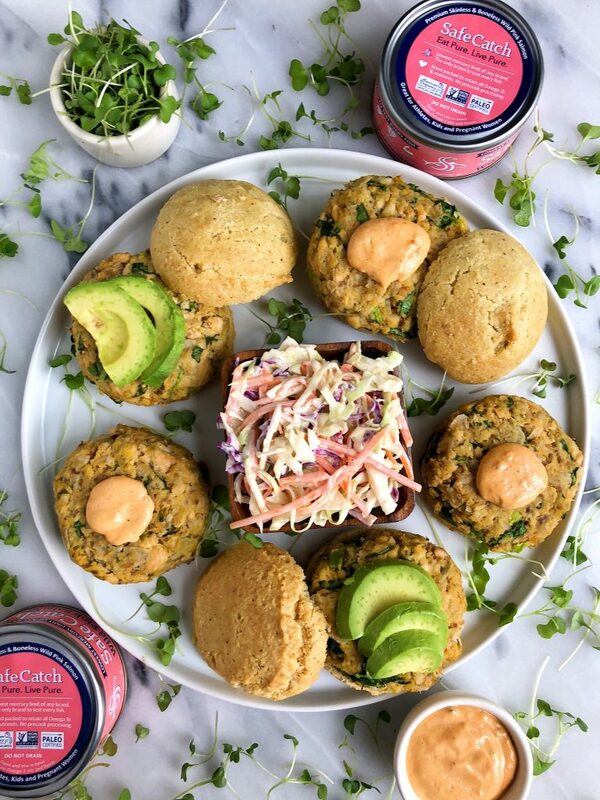 Once you try these Paleo Jalapeño Salmon Burgers out using Safe Catch wild salmon, here are a few of my other favorite recipes using their products: Spicy Salmon Quesadilla, Whole30 Tuna Salad and 4-ingredient Tuna Avocado Cakes. Don’t forget to share these gems with me on Instagram once you make them! I hope you enjoy them as much as I do. Thank you Safe Catch for sponsoring this post! It means so much to me to work with brands I love and believe in here on the blog! I’ve only tried making homemade salmon burgers once before, but I need to make them more often! Love them and so simple to make too when using canned salmon. What can we sub for mayo? any may works – vegan mayo, fabanaise, etc. but you need a mayo! Do you have any suggestions for an egg substitute for the burgers? flax egg could work but i haven’t tested! Can we use fresh salmon?